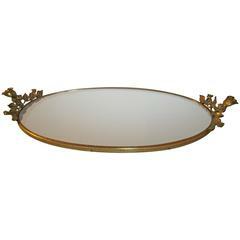 A beautiful Midcentury oval brass and mirror vanity tray with decorative rose and leaf handles, circa 1960s. Piece measures: 21 in. long from handle to handle. A glamorous polished brass with copper color leather covered back. 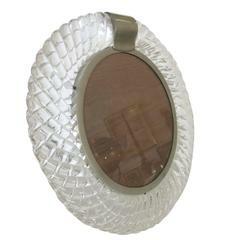 "Wish Bone" vanity mirror by Charles Hollis Jones. Newly restored. Dimension: 28" high 17.5" wide and 8" deep.